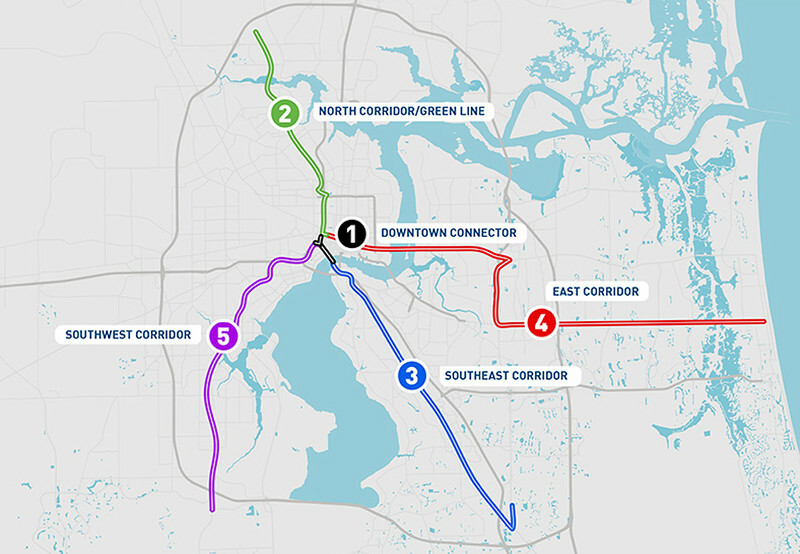 The $33.9 million East Corridor project is funded by the FTA, Florida Department of Transportation and the JTA and includes 21 branded stations, transit signal priority at 32 intersections (holds green lights, allowing buses to move through intersections without stopping) and off-board fare collection. The Flyer makes fewer stops and offers 10-minute frequency during weekday peak hours and 15-minute frequency in weekday off peak hours. The First Coast FlyerTM Red Line will operate with 19 energy efficient compressed natural gas buses offering complimentary Wi-Fi, mobile ticketing with MyJTA and bus arrival information with NextBus. The Red Line is scheduled to launch in December 2018 on the East Corridor. It will operate between Rosa Parks Transit Station and the Jacksonville Beach along the Arlington Expressway and Beach Boulevard with stops at major destinations, including Florida State College Jacksonville South and Downtown Campuses. The Green and Blue lines comprise 20.5 miles and laid the foundation for a regional transportation network that has boosted our economy and enhanced the quality of life in the community. 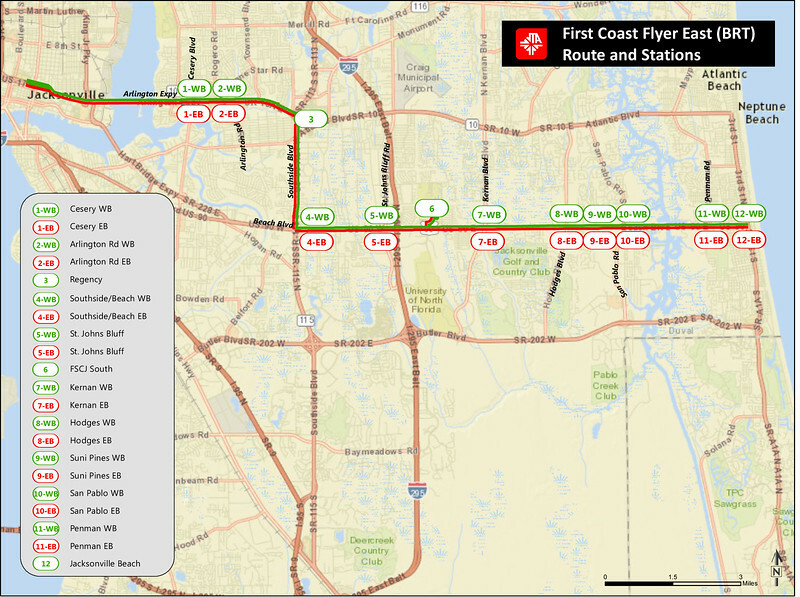 When completed, the First Coast Flyer will cover 57 miles of destination travel, and will be the largest bus rapid transit system of its kind in the Southeast. For information about the First Coast FlyerTM, please contact the JTA’s customer service line at 904.630.3100; Florida Relay at 800.955.8771 or visit www.fcf.jtafla.com.